« how are you doing? I started these last summer sometime, but then other projects started encroaching, pretty soon my older daughter started Kindergarten, then it was Halloween things and Christmas gifts to make. So my cotton grannies were stashed in a bag and thrown into the spare room (= messiest room in the house). But now, with this new theme in January, even if I don’t finish the blanket/throw/whatever it is I end up making, at least I’ve remembered them again, and can hopefully make a little more progress. Thanks for the incentive and the gentle push! Ooh, pretty colours! Thanks for sharing your squares with us. I love the colors in those. Very spring-y! 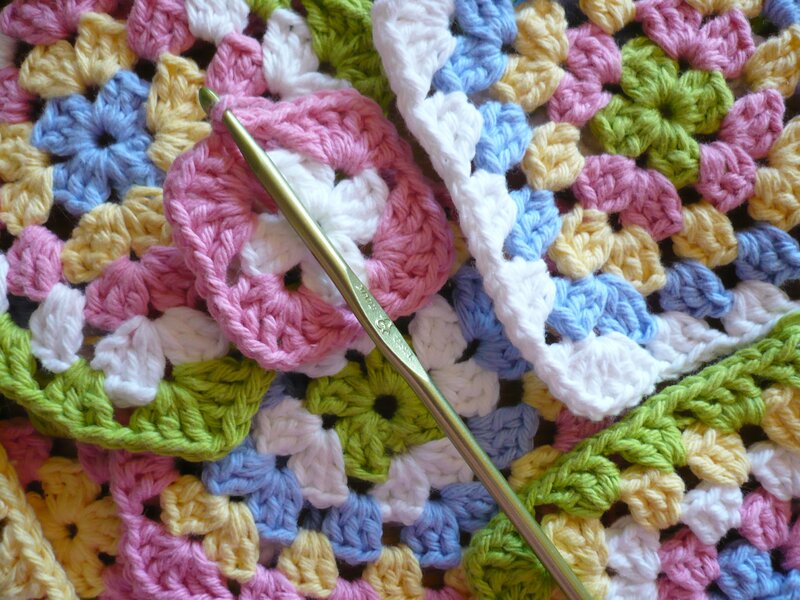 I admit to loving these spring-y colors too………..it will be beautiful when complete!